Make sure that shoes come off so that the floors don't get scratched. If you have a shoe room, great, if not place a mat and a rubber shoe trough by the door. Vacuum floors before washing to ensure that grit does not scratch the floor when it gets pushed around by a mop. If it’s a urethane or polyurethane finish they are protected from stains and water damage, but you still want to be careful not to over wet them. Water can seep into the cracks and cause damage. Use a mild, all-purpose cleaner in a spray bottle or a well rung out mop. Follow with a dry mop, an old towel or a microfiber cloth. Acidic products, such as vinegar solutions can cause dulling over time. You may want to occasionally do a deep clean with a mild vinegar solution of one cup vinegar to one gallon of water. Try wiping the floors with steeped black tea. The tannins bring out the natural stain of the wood. If it is a wax finish, do not wet mop at all. Vacuum, sweep and dry mop only. 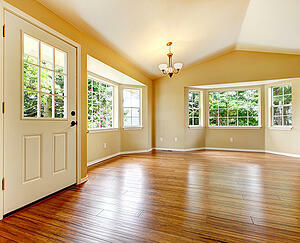 Laminate floors are an inexpensive alternative to hardwood flooring and are pretty easy to care for. Again, you don't want to wet mop because water can seep under the planks and cause damage. First, vacuum, on floor not carpet setting, to remove grit. Choose a cleaner designed for laminate flooring or a mild all-purpose cleaner. Then simply spray on and wipe down with a microfiber cloth, towel or dry mop. Vinyl is the favorite choice for many families and people with high use areas because it is easy to clean and inexpensive. Choose an all-purpose cleaner. Spray on or use a well wrung mop on the entire floor if it’s a small room or just one section if it’s a larger room. Use a microfiber mop, and an old towel to wipe dry. Clean at least once a week, and more often if it is in a high traffic area. It's that simple. Carpets are the most challenging floors to keep clean, but they can create comfort like no other flooring can, and a few simple tricks will go a long way towards keeping them like new. Sprinkle baking soda, borax or cornmeal on. Leave for an hour and then vacuum up. This will help to absorb moisture and odors. Use vinegar, rubbing alcohol, hydrogen peroxide or ammonia to spot clean tough stains like wine and chocolate. Vacuum often and go over each section up to 8 times. Once a year, hire a professional carpet cleaner or rent one and do it yourself.